Northern Province Fisher People's Alliance organized its organizing committee meeting on 23rd June 2012 at National Youth Services Council Auditorium, Kandy Road, Vavunia. 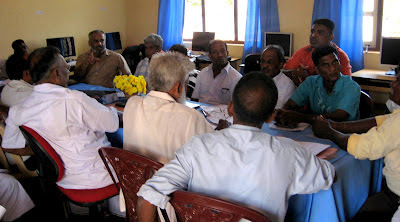 participants of Mannar, Jaffna and Kilinochchi Follow and evaluate the decisions of 31st May Minutes, the meeting held at Jaffna alliance office and discuss on Preparatory work and the organize of the AGM of APNFP, and Some important notes from Reincorpfish Project. 1. Mr. S. Thaveratnem, the co-chairman of the ANPFP welcome the group. · Follow the decisions of 31st May meeting and to finalize the proposed constitution. 2. Introductory note from Dr. Soosai Anandan, Senior Lecturer, Dept. of Geography, University of Jaffna. 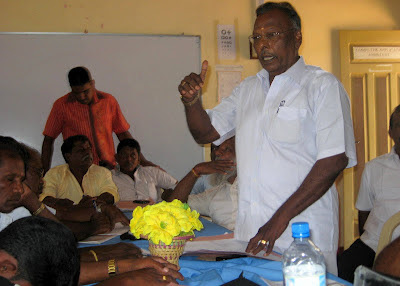 There was a small group of Jaffna district with members of NAFSO met on 31st May at the alliance office at Jaffna. Now the report has been circulated. There are some points we discussed and planned should be clarified. The situation of fishermen became further deteriorated. The meeting of the Reincorpfish project was held at Cape Town, South Africa. Herman Kumara, Dr. A.Soosaianandan and Ravi from university of Jaffna, Dr. Oscar Amarasighe, Dr. Terney Pradeep Kumara from university of Ruhuna participated from Sri Lanka. The main project actors are from Sri Lanka, NAFSO, university of Jaffna, university of Ruhuna, and from India, Madras Institute for Development Studies[MIDS] and FISHMARC, and university of Amsterdam, from Holland and university of Cape Town from South Africa and Masifundise from South Africa are the main partners of the work. That is the way the project is operating, and the structure. Dr. Soosao emphasized that there is a necessity to have a continuous dialogue on the issues, mainly Indian Trawler issue in a collective manner. Unless we united, it is difficult to overcome any of the issue. Issues of Southern fishers come to Northern sea is also an issue. This is also explained to the southern fishers. There was a 3 day seminar on BOBP and Dr. Soosai has attended to that. 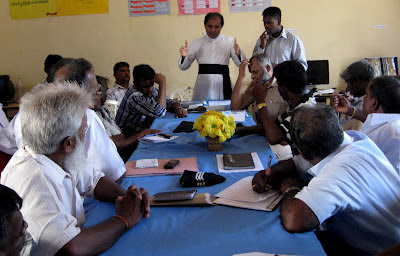 Some fisher leaders were also attended from Jaffna. Trawlers and dingi boats are coming from Tuticourin to Vankalai, Thalvupadu in Mannar, and Kalpitiya areas too. This is a big issue at Mannar district. As there were 15 delegates from India, we were able to raise the issue of Indian trawlers and the adverse effects on Sri Lankan fishermen, their economy, destruction of environment, social tensions among the Tamil fishermen in the north. At the same meeting sea erosion, Dynamite fishing, trawler issues were discussed. The discussion was held with the presence of the Dr. Damitha De Soyza, the secretary of the fisheries ministry. So, the trawler issues of Pesalai and Gurunagar were also highlighted with the secretary. The secretary of MOF was ordered to the DFEOs at Mannar and Jaffna to totally ban the trawling and report back to the her. 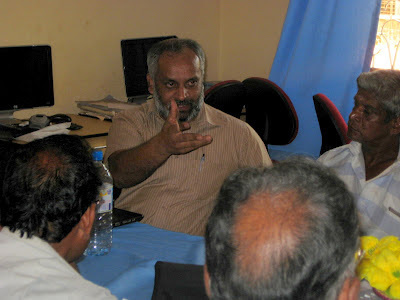 The navy officials were there at the meeting and they explained there is no pass system at Mannar. But the fishers who were present at the meeting had explained about the difficulties with the pass system. So at the same meeting secretary of the MOF has given some solutions. Also Dr. Soosai reported that fishermen complained to the fisheries ministerial secretary that the Indian trawler operators are coming to SL side for sell their Sea Cucumber catches as this is a banned species to catch in Tamil Nadu. 3. Mr. Thaveratnem thank to Dr. Soosai for the engagement of the discussions with the Secretary of MOF and the BOBP team on the fisheries issues faced by the Tamil fishermen in northern province of Sri Lanka. Mr. Thaveratnem stated that the political interference on fishing industry has substantially increased in the 4 districts. We can increase the production further if there is a freedom for the northern fishermen for fish with better facilities. There should be a master plan for fishermen to develop fishing industry with their knowledge and experiences. In Jaffna district, from the Karainagar to Vadamarachchi areas have been affected with destructive fishing. Due to disturbances, use of stake nets in the sea, the boats cannot move freely in the sea. Kokilai to Peiparapputti[85 Km] areas the beach seine and deep sea fishing is disturbed. This is due to the migratory fishing, high security zones and many other restrictions in those areas. Nandikadal, Nayaru, Kokilai, Salikadal, Sundikulam lagoons have been identified as potential areas for inland fishing. However, there should be a specific plan by the fisheries organizations, fisheries cooperatives to develop inland fishing industry in the area. So far there is no such thinking and need to prepare with the involvement of fishermen, fisheries officials, fisheries experts, university scholars, I/NGOs and researchers. Southern fishers come to those areas and catch sea cucumbers, use light course, purse seine nets, and lost the harmony along the coast. The fish schools are not coming to the coast due to those practices. The southern fishermen use scuba diving with oxygen tanks to catch sea cucumbers. The northern fishermen who are living in the area are not permitted to use those equipments and exploite resources as Southern fishermen do which is a discrimination. There are more than 1500 families who are the permanent settlers in the area has been disturbed their fishing practices. There were 7 beach seines which are belong to Sinhala beach seine operators who have been operating in the area for generations and registered at Mulaitivu district are also disturbed their beach seine operations due to those alien Scuba divers. There are 4300 fisher families living in the area. There are around 18 fisheries cooperative societies operating at Mulaitivu district. Even after one and half years of the formation of alliance, we were not able to go and meet the Mulaitivu people and bring them to join the alliance. The 18 fisheries cooperative societies are not able to work independently in Mulaitivu district. The people who have close connections with military and associate with them have the opportunity to work closely. So the alliance members who were gathered there agreed to meet them and bring them in to the alliance as early as possible due to the serious issues faced by the fishermen there. "We should know what is going on at Mulaitivu among our fisher communities. 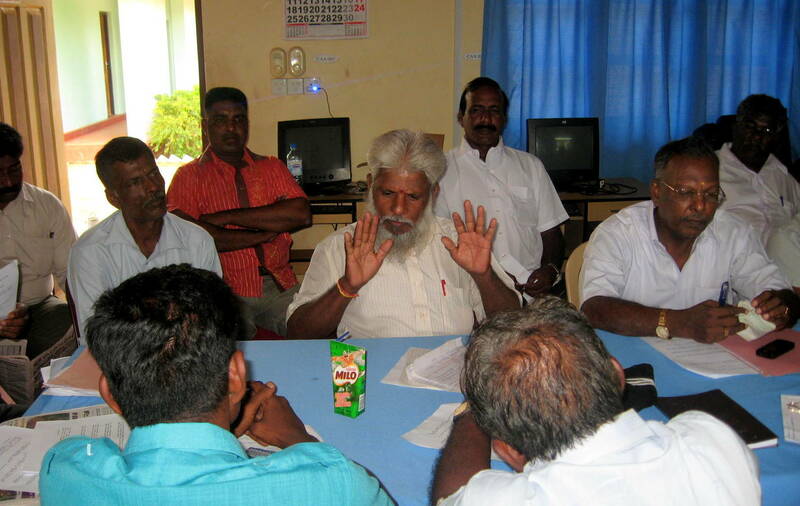 Hence we need to talk to GA at Mulaitivu and go to meet the fisheries cooperative societies. We need to take a decision when to go and who will go? We can't delay this any further. Let us plan the date and the team to go there." A team will visit the fisheries cooperatives and members from all three districts will be participated to it. So, from Jaffna 6, Kilinochchi 2 and Mannar 2 will attend to this work. This visit will be organized by Mahesh and Sooriuakumar of Vadamarachchi area. The group spent substantial time to finalize the alliance constitution. There was a draft presented by Sooriyakumar which was drafted by S.Thaveratnem and Sooriyakumar as agreed at the previous meeting held on 31st May. ü There is a federation only in Jaffna. Others have only Samasams but they can represent the Alliance. ü In northern province, there are 4 sea going fishing districts and one land locked district, which is Vavunia. The building of the lives and livelihoods and to plan their development and protection of the war affected people in the northern province districts. ü Enhance the livelihoods opportunities and build up the trust of the fishing communities on their future. ü Improvement of Culture, arts of the fisher communities. ü Build up unity in the northern province fisher communities and bring them to upper levels through forming groups, samasams based on districts. Advisory Board of the Alliance should be consist of following sectors;. On special remarks by Sooriyakumar said that the NAFSO should be remembered as the founders of the alliance. They also could propose their suggestions in the general body. They should be Founders and at the same time supporting to the alliance as resource generators to the alliance. There should be an action committee to be appointed to the alliance. duration of the action committee will be three years. ü the roles and responsibilities of the AC will be defined by the drafting committee and will adopt at the AGM. The gaps of the constitution will be filled by the drafting committee. The drafted constitution will be circulated before the General Body Meeting. For that, the drafted constitution will be sent to NAFSO and will be printed and send to each district organization, samasam and alliance office. 7. The group agreed that all the policy decisions should be made at the general body meeting which will be take place every three years time. The difficulties are well known to all these three districts because we meet together. But not about the Mulaitivu. So, we will bring them to the alliance before the AGM. ü Fisher people are facing serious difficulties at the sea and the land. So, we cannot live like this any longer and should work for change. We need to take a decision to overcome these difficulties and to implement them. Unless we implement these decisions, we will not overcome them. ü We will meet at Vavunia, Colombo, Negombo and anywhere and to strengthen the alliance. If we want to strengthen the alliance we need to act and find solutions for people's issues. We need to take all these decisions to the village level. Educate the fishermen on these issues and the way we want to move forward should be known to the members. So, it is important that we get them involve. We need to pressurize the Colombo authorities and they should listen our voice. The general body meeting will be held at Mannar on 23rd August, 2012. The Mannar fisheries federation will organize the meeting at Mannar with the consultation of the organizing team. There will be two meetings held before the General Body meeting. 10. At the end of the main session, Mr. Aruna Roshantha, the chairperson of All Ceylon Small Scale Fisher People's Trade Union addressed the Alliance leaders. Mr. Aruna emphasis to have a strong fisher people's organization. Because of lacking of such a strong body, fisher people could not address the issues of fuel crisis, Indian trawler issues or any of the difficulties we face. So, the unity among fisher people is very important in whatever the form. We are here as we want this unity, we want to continue this in the future as we emphasized this at the formation of the Alliance last year. We will keep close touch with our fisher brothers in the northern districts. Count us as your brothers and sisters of this struggle. Your struggle is ours and vice versa. Fr. Sherad also extended the love and care of the southern groups in which we want to build strong solidarity among the fisher communities in the north. Now there is a southern group is forming to work closely with the northern fisheries groups. The work has been planned to identify possible work parallel to the alliance work. 12. Herman Kumara, shared the outcome of the southern group work. 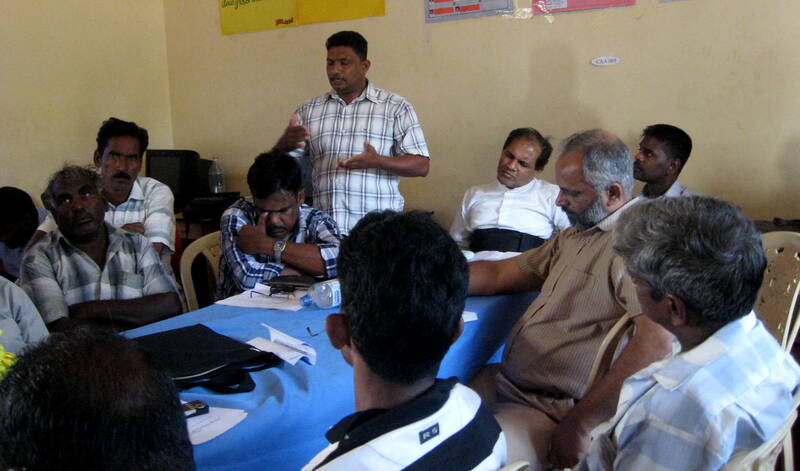 A concern group of southern organizations met at Negombo on 16th based on the issues related to northern fisher people. This group decided to meet again on 3rd July with wider team who are concern on northern fisheries issues. The main aim is to take a stand with the northern fisher people, when they plan for their future. So, a team was identified as concern group and will meet with more details on 3rd July. At the same time the Reincorpfish group met at Cape Town south Africa. The team decided to support the alliance directly to sustain their activities. So, there will be some donation from the Reincorpfish group for alliance activities. There should be a bank account to transfer the funds. This will be used for the alliance activities such as organize the policy dialogue in November and other basic running expenses of the alliance. Prof. Maarten Baavinc had sent a message saying that ZOA will contribute to convene the policy dialogue in November. Also will support to provide furniture or basic equipments for the alliance office.